How to Take Your Five Children to Disneyland and LOVE IT! For Christmas this year we asked the children if they would like a ticket to Disneyland in lieu of any other presents. They all jumped up cheering "DISNEYLAND!" and so the decision was made. Taking five children anywhere is a daunting task. I will now share with you what we did right and what we will do better next time. We stayed with friends. Yes, we are lucky enough to have friends who live within thirty minutes of the park. This was really great because the children had a place where they could play, feel comfortable, and get a good breakfast before going to the park. It was also so much fun hanging around and talking with our friends that we missed morning rush traffic and rolled on over to the park without any difficulty. We bought the one day- one park passes. These were $66 for adults and $56 for children. That is a great deal! To get into the park was $50 when I was eighteen, so the ticket prices have not kept up with inflation. If you're going to be there for four days, go ahead and get your park hopper, but we only had one day and there was more than enough to do at one park. 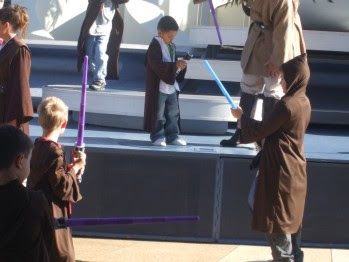 We went to the Jedi Training Academy. Awesome show! Don't miss it! About half of the kids in the audience got to go up and learn a light saber routine. After dark, we bought one of those flashing necklaces and put it on our five-year-old. That made him really easy to spot and hard to lose in the crowd. We will bring a picnic lunch. While my husband stood in the long line for food, my kids had enough time to run all over Tarzan's Treehouse. Then when we rejoined him and got our lunches, there was no where to sit! We had to wait until someone else finished their lunch and then we could finally eat. We could have gone on one or two more rides if we had just brought a picnic and ate it at the picnic area. We will not go into the Innoventions pavilion. There were VIDEO GAMES in there. My boys can play video games for free at home, but at Disneyland we are paying to even be there!!! I could not believe they wanted to play video games at Disneyland! We will not leave the park after ten o'clock and then drive all the way to Ventura. Yes, the scariest part of the trip was not the spooks in the haunted mansion, but driving through Los Angeles at midnight on Christmas Eve, trying to stay awake after hiking around Disneyland all day. Thrills for young and old alike. I always used to say that going to the beach was better than going to Disneyland. So, to prove my point, on Christmas Day we went to the beach. The trip began auspiciously when my husband drove the van's front tire off the pavement and got us stuck. We called our roadside service, but how are you going to get a tow truck on Christmas Day at some remote place on Highway 1? The dispatcher said she'd have to call us back. Then, in the true spirit of Christmas, another family noticed our situation and the father and teenage son propped the tire with some rocks and pushed the van onto the road while Russel backed it up. It was our best Christmas present all day! The beach in December is NOT more fun than Disneyland. It was windy and cold. We got sandblasted and pretty soon everyone was crying for their shoes. So much for dipping our toes in the icy Pacific! Still, the thrill of seeing the ocean was enough that none of the children wanted to leave. I had to promise my daughter a return trip in the summertime to get her to leave the beach. So that's the report on our Christmas Vacation! Happy New Year! Happy Three Kings Day! 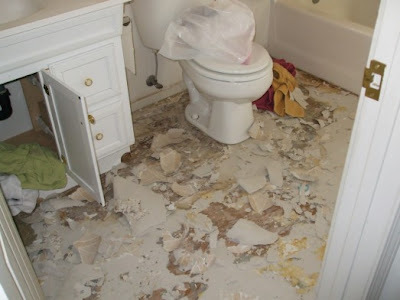 For a long time, I just had a bad feeling about that upstairs bathroom floor. I thought that the floorboards were rotting. There was a squishy spot. If I put my heel down on it just right, it gave a little bit. I wanted to rip up the vinyl flooring and see what was going on. My husband assured me that there was nothing wrong with the floor, and that I was only suffering from old-home-owner's anxiety. Then, one day as I was scrubbing the floor, I noticed the vinyl had already started to peel up in one corner by the vanity. Experimentally, I pulled it up a little more and saw that the wood underneath was WET! Soaking WET! AHHHH! DISASTER! Where had that water come from? We were going to have to tear up the whole entire floor and rebuild the house! I started digging in the cupboard under the vanity and found several ruined rolls of toilet paper and a puddle under the sink. It turns out the little lever that controls the sink stopper had been dripping water every time someone ran the tap. This had seeped down along the back wall and then into the floor, all without me noticing! Fearing for my floorboards, I ripped up the vinyl until all the wet wood was exposed. At first I felt terrible, but after a while of working at it I started to calm down. I let it all dry out for a few days, then treated it with chlorine bleach to keep it from getting rot. The floorboards are fine. That squishy spot wasn't the wood at all, but a place where the vinyl wasn't stuck down well enough. Now I get new vinyl for my floor! My kids have been having fun peeling up the rest. In fact, I think I'm going to paint the bathroom and maybe even get a nicer vanity to replace the water damaged one. Every disaster is a triumph waiting to happen! 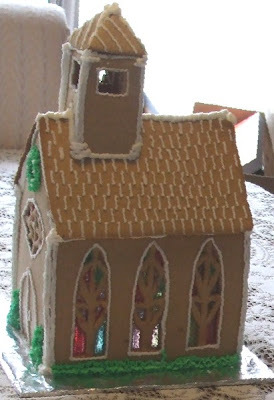 My daughter and I made this gingerbread church complete with "stained glass" windows and a little bell in the bell tower. We've never tried a church before and I thought it turned out rather well. My daughter handled all the drafting. She got out paper and a ruler while I mixed up the dough. I discovered I was out of molasses, so dark corn syrup had to do. To create the stained glass effect, I rolled the dough out on cookie sheets lined with greased aluminum foil. Then I cut the excess dough away from the wall pieces, and lastly cut out the delicate windowpanes using templates my daughter designed and drew. She smashed up Jolly Rancher candies with a hammer, and we carefully spooned the crushed candy into the windowpanes. Bake for fifteen minutes at 350 degrees Farenheit, and then cool completely before removing the foil. Spectacular! I used an egg white based frosting to glue the house together, but all the decorations were made with ordinary shortening based icing. I like the way the roof turned out, with just the suggestion of shingles. Next year we can cut a hole in the bottom of the board and run a light up inside.